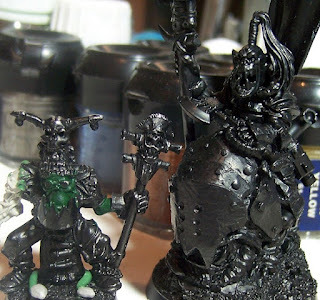 Hephesto's Forge: CSM Nurgle Sorceror - better pictures! 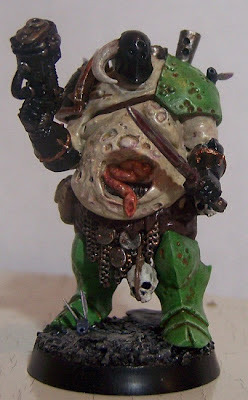 CSM Nurgle Sorceror - better pictures! I'm quite happy with the end result, though the shade of the green armour does seem to be a tiny bit off compared to my old Purge miniatures (see group shot further below). 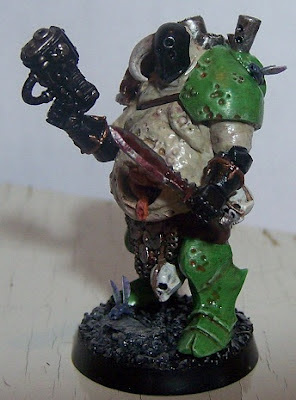 The is part due to the different feel of the armour, which has less distinct, deep areas and sharp corners suitable for the wash techniques used on the original squad. 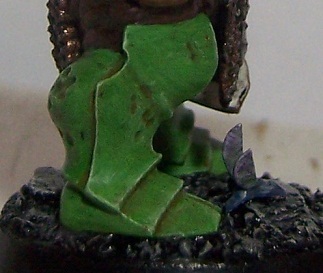 Secondly, I opted to add more damage and decay to the armour than the normal Purge Chaos Space Marines. The original colourscheme needed a that little tweak to actually work with the large areas of skin on this miniature. Instead of merely going for brown ink washes, I started from an orange basecoat for most of the damaged armour segments. The flies are definitely my favorite bits on the mini and I'm glad I took the advice of a few fellow Astronomican forum members to ditch the original backpack for something more unique and striking. Though it certainly made for a much tougher paintjob with so many details in such a small area, it was great fun and added to the overall feel of the mini! 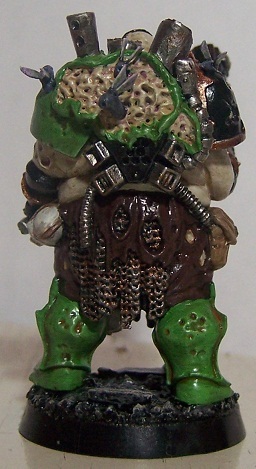 In addition it just feels rather nice to work on such an oddball character as an addition for an old squad from my collection. 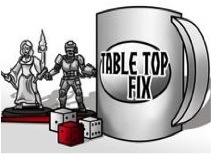 It is definitely tempting to revisit thee guys again, but I have plenty of other minis that first need attention! And that does it for this update, coming up this weekend and next week - Ork characters, a few random minis & back to the Tyrant's Legion.